The adoption of green technology and manufacturing processes has increased greatly over the last decade. This new trend has been particularly noteworthy in the flat roofing industry. Many contractors and manufacturers worldwide have come to realize that it is everyone’s responsibility—and in everyone’s best interests—to make the planet healthier and greener. At Champion Services Roof Rescue, we couldn’t agree more. Here’s how our silicione-based liquid roof coatings help create a more sustainable solution for your business. Today’s manufacturers and roofing contractors are producing using construction materials that have a much smaller impact on the environment. For many years, commercial property managers have struggled to strike a balance between reducing costs and their desire to become more friendly to the environment. This is totally understandable since choosing to minimize the carbon footprint typically costs more than traditional approaches. However, there is good news! When it comes to flat roofing, the price you’ve to pay to go green is quite affordable. Also, you don’t have to sacrifice any quality. Liquid roofing is an excellent system for flat roofs. Durable and attractive, liquid roofing can be applied to both new construction and existing structures. 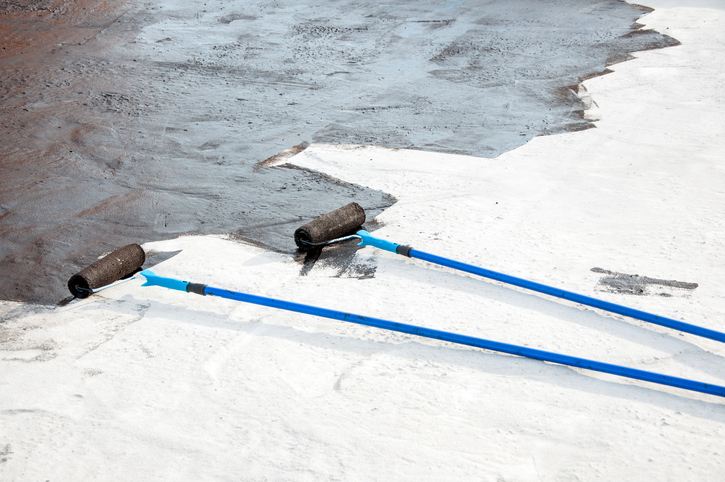 For existing buildings, liquid roofing can really inject new life into your flat roof. Environmental sustainability is one of the hallmarks of liquid roofing. A silicone-based coating is applied to your roof. The materials used in this roofing system are environmentally friendly and technologically advanced. Liquid roofing also creates less mess since it can be applied over your existing roof. There are no scraps produced during the roofing job, which also reduces labor costs. It also eliminates the hauling away of the old roof to a disposal site or a landfill. When you choose this type of roofing, your company can reduce your ecological footprint, create huge savings, and achieve sustainability. With all these advantages, it’s easy to see why liquid roofing has become so popular in the world of commercial roofing. To learn more about our liquid roofing services, including Instacoat Roof Restoration and GacoFlex Silicone Coating, call Champion Services Roof Rescue. Champion Services Roof Rescue is the cost-effective alternative to commercial roof replacement. Offering commercial liquid roofing and other services to Rock Hill, Myrtle Beach, and South Carolina. Request a quote today!